Dog's use their teeth and tongue to clean their body and a certain amount of chewing or licking the paws and pads is normal. Too much chewing or licking, however, can cause damage to the pads. It is important to understand the root of the behavior and fix the underlying problem. Whether a medical or training issue, obsessive pad chewing is an unhealthy behavior. Your dog could chew its pad because it has been injured. It could continue for long periods because the injury is painful and the dog is attempting to soothe the pain. Extreme weather conditions in the winter such as snow and salt-covered streets can cause abrasions or damage to the pad that is less visible -- as can hot asphalt in the summer. The dog may have stepped on a burning cigarette or grazed the pad running and playing outside. Check for cracked, red or bleeding pads. A dog may chew its paw in an attempt to remove a foreign object. Check for a splinter or pieces of glass stuck in the paw. 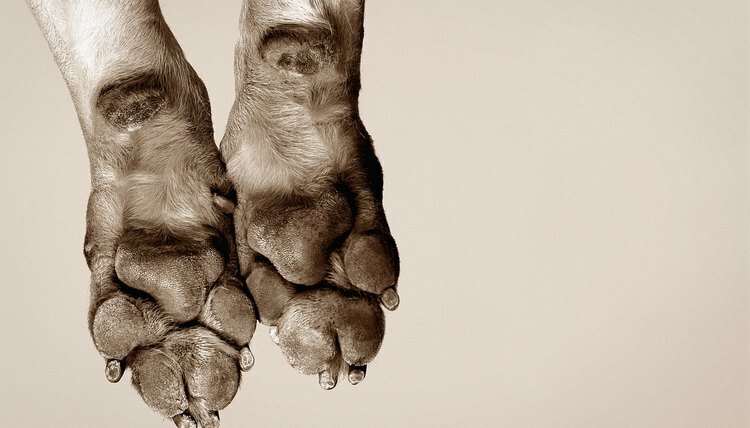 If the dog is not showing any other signs like limping, it could be something smaller like a pebble or dried grass that is stuck in between the toes. Cut away the hair on the pad and in between the toes to check all areas of the paw. A yeast or bacterial infection can be the end result of obsessive chewing that completes a vicious cycle and causes the dog to continue chewing its paws. The initial problem can start as a scrape which then through constant licking or chewing becomes a haven for bacteria. The dog can pick up a chronic yeast infection, such as athlete's foot, and make it worse by chewing and licking. A classic symptom of a dog with allergies is itchy pads. The inflammation caused by the allergies itches and the dog will constantly chew and lick its paws to try and relieve the itchiness. Allergies can be caused by many different things but you can start with the dog's bed, toys and environment. Investigate the skin for bumps that can indicate an allergic reaction to food. Experiment with the dog's diet and try to eliminate foods with common allergens such as corn, wheat and soy. The paw chewing and licking can simply be a bad habit started when an underlying problem occurred but was healed. Out of habit and the comfort it brought the dog before, he may continue the behavior. Boredom which has turned into an obsessive compulsive disorder can also cause the behavior. Plenty of exercise can help alleviate the symptoms. Try aversion therapy by putting an unpleasant tasting but edible substance like no nail biting polish on the pads or covering them with a sock. Can You Put Normal Cotton in a Hamster Cage? Why Is My Dog Itching & Scratching? Why Would My Hamster Chew Its Foot? Are Hamsters Allergic to Anything?